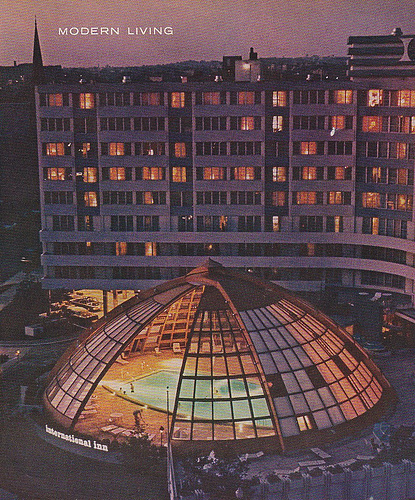 The House History Man: Groovy Pool at the International Inn, baby. The structures located at 10 Thomas Circle have had a long and varied past, from a regal dwelling believed to have first been built in 1843, to the large and streamlined International Inn, built in 1962 with an innovative pool enclosure, designed by controversial modernist architect Morris Lapidus. Interestingly, while the mansion that occupied the site from 1843 to 1947 was elaborate, it was not unique for the era or a rare example if its style when demolished in 1947. However, the International Inn that replaced the dwelling, while not pleasing to every eye, has its own, more contemporary history that may be far more innovative and unique to the architectural historian. It often takes decades to develop an appreciation of architectural styles, and critiques of today’s designs often need to be reminded that the Victorians thought little of Greek Revival architecture, and routinely adapted and upgraded it to fit their more fanciful taste. All styles are subjected to this cycle, as periods of art noveau, art deco, streamline, and even 1950s modern all went through periods where they are lucky to exist all today. In any event, the first house that is known to exist at 10 Thomas Circle was a house built for Charles L. Coltman (1800-1862), an early brick maker and builder in Washington -seen above as a red brick house to the right of the church. It was believed to have been built in 1843. However, the house was long known as the Wylie house when a later owner named Judge Andrew Wylie occupied the house during a time when he presided over a sensational trial surrounding the Lincoln assassination conspirators. It sat prominently on the northeast section of the circle until a fire on April 20, 1947 destroyed a significant portion of the structure, and it was torn down a short time later. In 1962, the International Inn chain of hotels hired architect Morris Lapidus to design a modern hotel at the site. It marked the beginning of a transition of Thomas circle from a residential circle to commercial uses. It appeared in the July 26, 1963 edition of LIFE magazine, seen at left. Lapidus was a highly successful designer of a new form of Hotel structures, albeit one that was panned by architectural critiques for more than 40 years of his career. Born in Russia in 1902, Lapidus began his design career by revolutionizing retail architecture: from the previous tendency of large display windows and small signs to his concept of letting the stores name become one with the building. His examples include the Floresheim shoe storefronts, where the ‘F’ extends from the second floor to the sidewalk, and shoppers literally wander around the remaining letters to browse their way right into the entrance of the store. would cost him dearly in the following 40 years of reviews of his work. 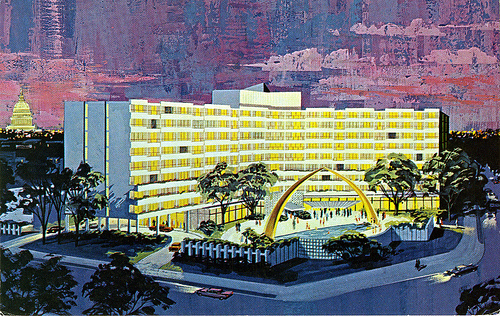 However, the user prevailed, and his hotel designs were highly sought after. Following the opening of the Fontainebleu, he became known as the architect of the “grand stairway to nowhere” for his elaborate, wide staircase overlooking the lobby and restaurant that simply led to bathrooms and a cloak closet on the second floor. However, women arriving in coats or headed to the ladies ‘lounge’ could then descend the staircase in their most recent fashions in an egotistical show for all in the hotel to gasp and admire. Needless to say, the staircase was very popular with users. Lapidus designed the famed Eden Roc Hotel in Miami Beach in 1956, and the Lincoln Road Mall four years later, today a hot spot in trendy South Beach. He is responsible for more than 1,200 buildings during his long career. 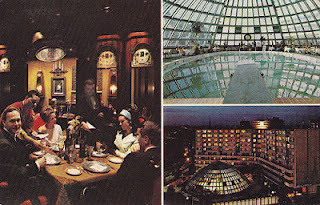 Lapidus designed the hotel at 10 Thomas Circle a short time later, in 1962, for the International Inn, in a similarly composed manor. It was originally painted with light and dark colors and bands of long balconies. At the center and facing the Circle, the pool area was defined with a highly innovative feature for Washington’s varied climate: a large, glass dome covering the pool which could retract to the open sky depending on the season. It was an instant landmark, and a hit with hotel patrons, as they could use the pool year round, and have the benefit of sunning outdoors or swimming on cold winter nights under a moonlit sky. The dome construction was captured by the Washington Post in a photograph that ran in their October 11, 1962 issue. Lapidus also included one of his features in the International Inn that he himself created on a business trip during his storefront façade design days. Dreading a walk carrying luggage down an endless corridor to the inevitable room at the end, he found that when one was faced with a curved hallway, they could only see a few doors at a time, and have no idea of how long the journey to the room would last: instead it became a bit of an amusement. With that easy design, Lapidus changed a frustrated traveler into one of complacency, pleasing most of all, of course, the hotel owners and management. 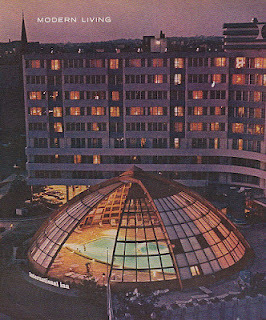 The International Inn retained the pool enclosure until well after 1981, and it was likely removed a short time later due to maintenance issues. After a long and distinguished career despite 40 years of criticism that almost led him to quit the occupation, Lapidus died at age 98 in January of 2001. Before his death, however, Lapidus enjoyed a tremendous interest in his designs, often participating in their renovation and rejuvenation in hot spots such as South Beach in Miami. 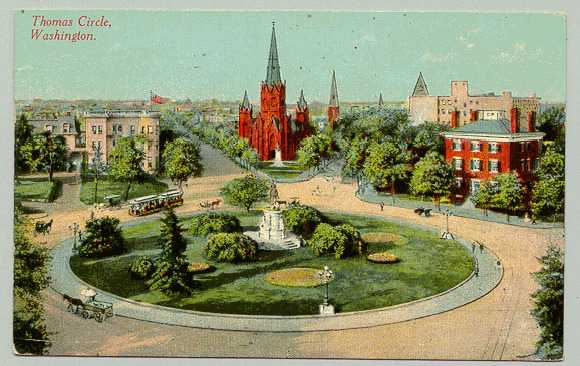 The hotel at 10 Thomas Circle is known today as the Washington Plaza.